After eating at Mie Abang Adek, my sissy complained about the over spicy taste and she's told me to I bought sweet foods at Aiola Eatery. I said yes because my generosity is also again curious about taste of milk coffee there. In the last few weeks, milk coffee becoming such a hits, since there is a small milk coffee shop in Jakarta which suddenly booming and queue to buy that ice coffee milk already so long just like train tickets for mudik Idul Fitri. I am a dairy coffee enthusiast already so long, since elementery school. It's because one day I got a fresh milk from a dairy farm and I can not drink it because it smells bad and I can't even handle it. So my grannie took a glass from me and boiled it again with added some spoon of coffee powder. Every go to the coffee shop, or drinking coffee wherever I am, I ordered coffee milk. I like my coffee being creamy even though I do not like sweet coffee. Small yet local coffee shop being the new hits in Jakarta , I think it's affect the culinary trend in Surabaya. The presence of Kopi Susu Kompleks IMO, being the part of it. 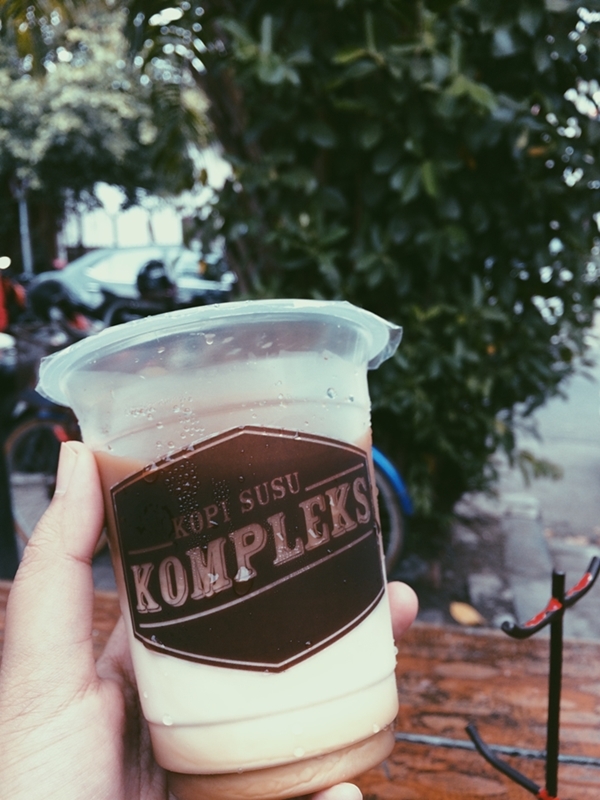 Kopi Susu Kompleks can be purchased at Aiola Eatery, a hangout spot located in the alley of Jl. Kusuma Bangsa around the area that Surabaya people often refer to as SMA Kompleks. Make a purchase, just come to the cashier, take and pay for the glasses of this Kopi Susu Kompleks which is located in the refrigerator near the cashier. Price for 1 glass is 14,000 IDR, I bought it two. When I tasted these ice coffee milk, this is milk with coffee as a little add, not the type of coffee milk as I do expected. Because the milk is dominant and there is a sweet that I think really disturb the original taste of coffee itself. Yes I'm disappointed because I expecting a 'serious' coffee milk, meaning though mixed with milk and little bit sugar but the coffee taste remains dominant and delicious. Basically I am not a fan of sweet coffee or any coffee drinks that I can't get the original taste of coffee. I think this is suitable for those who like to drink a sweet coffee. Do you like drinking coffee as me? What do you like most about coffee?